1. 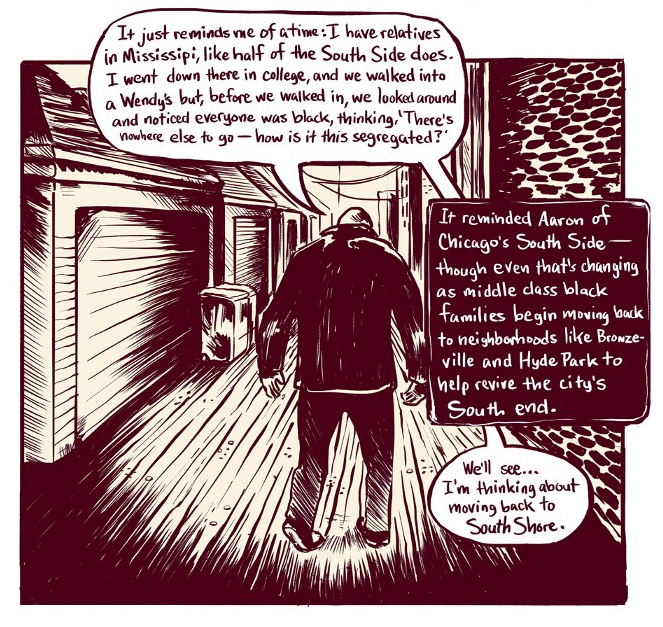 I meant to do this a while ago, but anyone who’s interested in the kinds of things I write about here – cities, Chicago, race, humans – really ought to read “South Shore State of Mind” by The Illustrated Press, the only Chicago-based purveyor (that I know of) of comics journalism. This piece follows a man from the South Side reflecting on the changes he’s seen in that neighborhood, but you should be looking for their other stuff, too. I know it’s not this easy, but…man. I don’t often write about this, because I don’t think I have much to say, other than ask questions, but I don’t think it’s going too far to say that the retail deserts in black neighborhoods on the South and West Sides are one of the tip-top most important issues in the city. They’re both cause and effect of so many things: health outcomes, vulnerability to crime, the fleeing of the middle class, and so on. It seems clear that one of the keys to getting people like my commenters to be happy enough to stay – and people of all races from other areas interested enough to visit – places like west Woodlawn is developing stronger retail corridors. And before you think that that’s impossible without more wealth in those neighborhoods, consider that study after study has found that Chicago’s black neighborhoods have far less retail than you would expect, even taking into account local incomes. I wonder if Chicago’s black neighborhoods are uniquely underserved by retail, or if its a Midwestern city thing. Perhaps the “all other cities’ statistic in Mario Luis Small’s paper is skewed due to inclusion of NYC? Yeah, I would think there would be strong regional variation. My impression is that a lot of the difference between NYC (and Boston, etc.) and Chicago in terms of black neighborhoods has something to do with the fact that black people in those East Coast cities are much, much more likely to be immigrants or the kids of immigrants, as opposed to mostly having roots in slavery-era America. The exact mechanisms by which that makes a difference, I’m not sure – though I could certainly make some guesses – but I think it’s fairly well established that there are differences. I don’t think it’s true of East Coast cities. Philadelphia doesn’t have many immigrants. There’s immigration to Washington, but my understanding is that its black population largely consists of people whose ancestors have been in the US since the slavery era. New York has a huge amount of immigration, much of which is black, but the non-Hispanic black population (which is about a quarter of the city) is again mostly descended from people who were enslaved in the US and not in the Caribbean; there aren’t enough Haitians and Jamaicans in the city to make that big of a difference. In Harlem, 15% of the black population is foreign-born (link), and it’s a recent enough migration wave that there isn’t a large number of second-generation immigrants in addition to it. That said, New York does have a lot of black-Hispanic racial integration, but trying to pursue this point too hard may lead to overinterpreting neighborhood differences. Huh, interesting. But still, 15% is so much higher than in any majority-black Chicago neighborhood – I’ve never seen above low single digits. It’d be nice to see a breakdown by city, I wonder if it’s available. I’m having trouble finding numbers, but I’d guess Harlem would have the least amount of black immigrants. The US census says that West Indian + Subsaharan African ancestries are around 1/3 of the black population, I read somewhere else that claimed 40%. Philadelphia would be a good comparison with Chicago, since it has more decay in its black areas than NYC or Boston and few black immigrants. I remember going to a McDonald’s in Prince George’s County that was almost entirely black, same with the train line (Green Line). Yeah, that’s insanely higher than in Chicago. As far as I know, the only real concentrations of Caribbean/voluntary African immigrants in Chicago are in the Uptown-Edgewater-Rogers Park corridor; the segregated black neighborhoods on the South and West Sides are almost all <5% immigrant. I bet you could write a book about the implications for race relations. Canarsie experienced rapid white flight and some racist violence even though the newcomers were mostly immigrant blacks (West Indian, previous residents were rather Italian-American). Whites didn’t seem to distinguish between either native or immigrant blacks moving in. Plenty of NYC rappers are of immigrant origin (for example, Notorious BIG), few pick up on their background. On the other side, you can have a black mayoral candidate describe himself as the child of hard working immigrants (via Barbados) , and give off a less racially tinged identity that white voters of his generation might relate to. the city’s population had to have been above that, as upstate couldn’t be very immigrant and I’d assume the NYC suburbs had a more “native” black population. Most of the black population is downstate, anyway. I think Boston has a foreign born % of its black population but it gets less attention than NYC as its black population is much smaller overall. The Miami metro’s black population I think is majority immigrant, only metro in the US that’s true. It’s interesting, the Jamaican food thing – jerk chicken (and, more recently, turkey – is turkey also a trend in black NYC neighborhoods?) is a staple food in Chicago’s black neighborhoods, even ones with vanishingly few Jamaicans or other Caribbeans. Car ownership may be an issue (although in most places there’s a large carless minority of 20-30%); the South Side also has way more suburban-style shopping centers than any other part of the city, because there was so much land available in formerly industrial areas. I’m sure that’s an issue for traditional urban retail streets. Finally: man, it’s just insane how much busier neighborhoods like that are in New York compared to Chicago. How much population have places like Bed-Stuy or Brownsville lost? Or have they not lost any? Of the black neighborhoods in Philly, my guess is that North Philly would be the most similar to the south/west sides of Chicago. Olney, West, and Southwest Philly all have sizable West Indian/African presence, Germantown has always maintained a non-negligable white population even through white flight, and the black neighborhoods in South Philly sort of share Broad street as a commercial corridor with whiter neighborhoods. There are a decent amount of stores, although it is rather run down. Max’s Cheesesteaks, which are quite good, and the bookstore Black and Nobel are probably the two places that someone from outside the neighborhood might feasibly go out of their way to visit. Interesting! I really need to make it out to Philly.